The participants will process their translation with the help of Paratext 8 , a program created for entering, storing, and checking the translated texts. They will also print drafts for revision. The course will explain the procedures and will also highlight any differences between Paratext 7 et Paratext 8. Start the Paratext 8 program using a desktop icon. 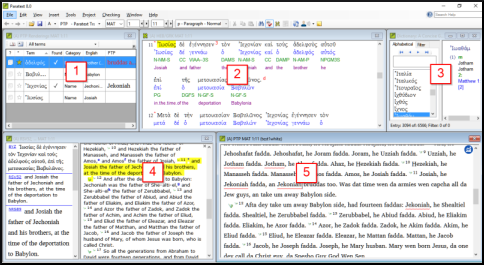 Open projects and additional resources, for example an English Bible, a source text, a source text dictionary etc. Effectively use the navigation toolbar to move to the desired book, chapter, and verse. Type the text in an open project with the help of USFM markers such as \c, \v, etc. in an suitable view. Use a keyboarding system (MS-keyboards or Keyman) to type special characters. Add additional markers for section headings, introductions etc. Draft glossary entries and add using the Biblical terms tool. Run the chapter/verses check to make sure that all the chapters/verses are present. Update the project plan with any completed tasks. Use Checklists to correct any formatting problems in section breaks and headings, paragraph breaks, layout and indents. Run various checks to make sure all the characters, punctuation, capitalisation and repeated words are valid. (Administrators need to setup the inventories/settings as required). Add project notes as needed to communicate with other team members and/or consultants. Produce and print PDF file for reviewers. what was the first and last (most recent) version of Paratext that you have used. Do a revision activity of the previous module. If a skill is quite simple, ask a participant to come and demonstrate the skill. Ask a participant to demonstrate the skill. Give the participant time to reflect, fill in the recall exercise, add to Anki. There are several stages in a translation project. In this first stage you will use many of the resources to ensure that you understand the source text, then you will draft and keyboard the text of the translation along with other materials and also begin the preliminary checks. BC1: Basic checks — chapter/verse and markers. The translator who organises his/her desktop well has all the resources necessary for his/her work.What are you going to do? You will start the Paratext 8 program and open a previously saved text combination. If needed you will open other resources, change the arrangement of the windows and resave the text combination. Choose a saved text combination. Your screen should look like the picture below (if not, see the following page). Arrange the windows as desired. Choose the name of the saved combination. 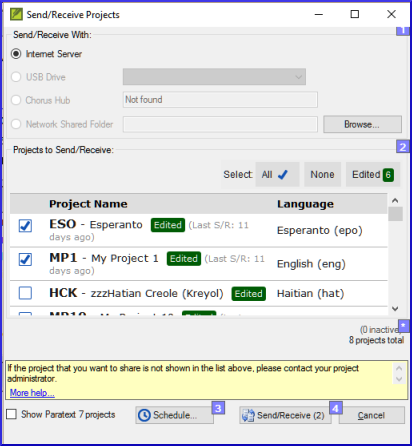 With Paratext, it is possible to have several project/resources open at the same time. However, rather than having too many windows, it is better to have severals text in one window. Click on a resource (at the left). If necessary, change the order using the up/down arrow buttons. You can change the text in the second pane by clicking on the blue link of the abbreviation for the text. You can also change the view (preview, unformatted or standard. You can open a source language dictionary with glosses in other languages. You can have a list of verses for a specific Greek/Hebrew word. The translators who their desktops have all the _ they need for their work. You use the menu to save or delete ___ of text. To open windows you use the __ menu. You can make a list of verses which have a word from the source language text by clicking _ (right/left) clicking on a in the source language, the choosing _ the your project . You use the Project Plan to help organise your work and see which tasks to do next. Once you have finished the task you mark it as completed so that you can report on what has been achieved. If you have used an earlier version of you will see that it has dramatically improved in Paratext 8 .Where are we? Before you can use the plan it must have been configured. This is usually done by your project administrator who will add the appropriate organisational plan and configure it for your team.Why is this important? There are so many tasks to be done in a translation project. It is important to have a system to make sure these are all done. Now that your plan has been configured, you can use the plan to see what tasks have been assigned to you to be done next. Then when you finish the task, you can mark the task as completed and see the next task to do. You can use this information to generate reports for supervisers and donors (see PP2: Project plan reporting).What are we going to do? A list of the various tasks and checks are displayed. Identify the next task for you need to do. Check that it is not waiting for another task. Do the task (see other modules if necessary). Click on the checkmark to the left of the status. It should turn solid to show it is completed. To mark other chapters as complete you can click on the word Completed. 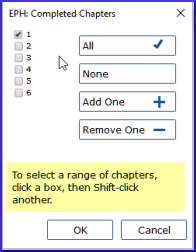 A dialog box is displayed with a list of the chapters. Check the chapters that have been completed. 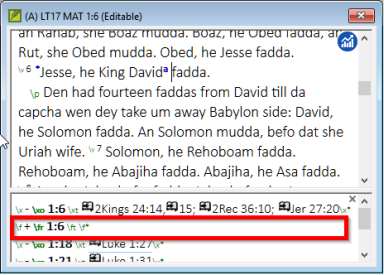 **To mark some verses only, click to the right and check the individual verses. If the task is a check, the status of the check will either say setup required or it will show number of remaining issues. A check is complete when there are No issues. Click the blue link "Setup required"
Paratext 8 will run the appropriate inventory or open the settings for that check. Complete the setup as appropriate. Close the window when finished. If there is more than one inventory you will need to set them up manually from the Checking menu. File > Save all (ou Ctrl+s). Return to the Project plan. The check is considered complete with there are 0 issues. This is the first stage of putting your translation into the computer. Once the text has been typed, you can run various checks on the content and format of the text. Before you can start typing your text, you need to move your cursor to the right book, chapter and verse. You use the toolbar to do this. Using the icons on the toolbar, change the project, book, chapter and verse as needed. Look at the titlebar of your project. The titlebar should either have your name or the word (Editable). If your project is shared and your name is not on the titlebar, you should talk with your project administrator. If it is not editable, try changing the view (see below). Paratext 8 has five views. All but the Preview view are editable. From the View menu, choose the view (usually Standard). Some orthographic characters are not found on the keyboard. To type these characters you need to press more than one key. Change your keyboard system as needed on your computer. Type the keys as in the table in . Note : You can use View > Highlight Invalid Characters to highlight invalide characters. Type the marker (e.g. s1 or ip) « Enter » (or select it from the list). You must always have a USFM marker after a title and before the verse. This is usually \p (paragraph), but it can be different (for example \q1). do we need to say move the cursor to where you want to split it? It is important to save your work regularly. You can add footnotes in the text at the place where you want the reference to appear. If you hover your mouse over the superscript letter the text of the footnote will be displayed in a tip box. To change the footnote, click the superscript letter in the text. To delete the footnote you can delete the superscript letter. If used, insert your USB key into your computer. The computer will make a copy of your files. A progress meter will be displayed. A message box will only appear if there are any problems. A lot of time is spent moving your cursor to the place where you need to add text or make corrections. Here are some useful keystrokes to move your cursor quickly. If the titlebar doesn’t say (Editable), you should try changing the __. To add a different marker (such as section heading) you press ___. To add paragraph marker you type . To insert a footnote, you use the _ menu and choose . To send/receive, you use the menu then . 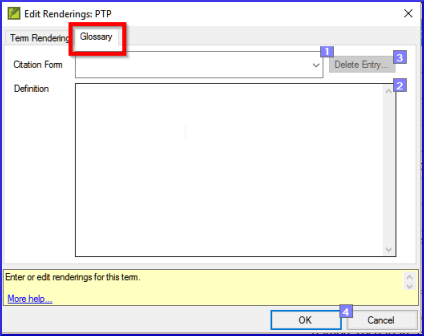 You will use the Biblical terms tool to add a rendering for the term and then use the glossary tab to enter the citation form and the definition. Move to a verse which contains the term you want to add to the glossary. 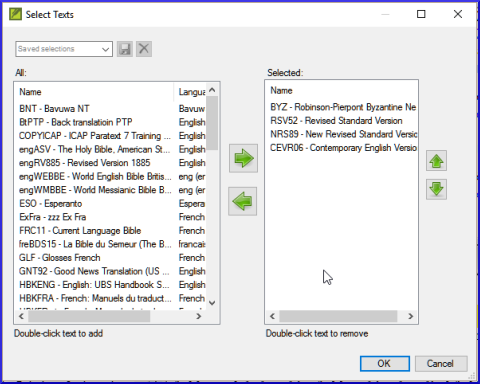 Right-click and choose "View Biblical Terms", then "Current Verset(s)"
The word and the definition will be added to the glossary in alphabetical order. If the word is already in the glossary, you can link a term to the existing entry. Edit the text as normal. Double-click on the word in the list in the top pane. You open the Biblical Terms tool from the menu. The « glossary » tab is on the dialogue. To open this dialogue you -click on the term in the _ pane. To view the glossary, you change to the _ book (after Revelation). You are going to run the first two basic checks using two different methods.The easiest way is to run the checks from the project plan. However, you can also do the checks from the checking menu if you need to check more than one book at a time. It is easier to run the checks from the project plan. (at the top right of your project window). A windows appears with a list of the errors. Double-click a line in the list. Correct the error in your project. Double-click the next line in the list. Continue for all the errors. Click "Rerun" button to check that all the errors have been corrected. Close the results list window. Continue with the markers check. If you want to check more than one book at a time, you can run the checks from the checking menu. The list shows an overview of the markers in your text. Update the progress on any task (see PP1 for instructions on each type of task). This can only be done by a project administrator. From the first drop-down list at the top left of the dialog, select All Tasks. In the "Assigned to" column, use the drop-down list to choose who will have responsibility for the task or check (listed in the "Task/Check" column at the far left). The report will contain a column for each project you selected. Choose the books as necessary. Page last modified on Monday April 17, 2017 22:28:17 GMT-0000 by matthew_lee.